The incredible Governor's Beach, Grand Turk. The Grand Turk Lighthouse at sunset. 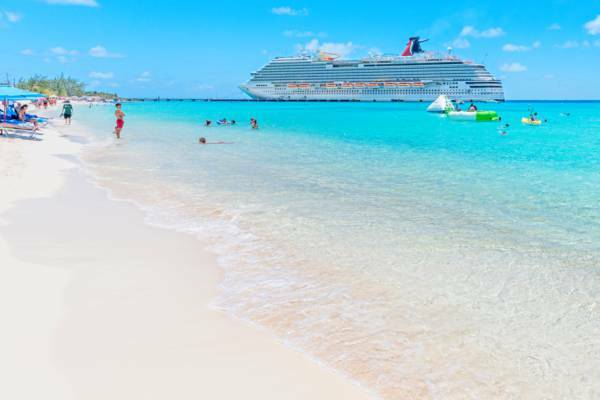 Grand Turk is a perfect cruise ship destination. You’ll find a small tropical island with a great selection of water sports, interesting historical sights, and best of all, exquisite beaches. The Turks and Caicos features a beautiful marine environment, and it’s no wonder that many of the island’s top activities happen on or in the ocean. There’s lounging on the beach, scuba diving, snorkelling, boat charters, kayaking, stand up paddle boarding, fishing, and whale watching. Another great way to spend your day on Grand Turk is simply to rent a car or scooter and explore the island at your own pace. Take in the historical ambiance, visit a secluded beach, and simply have fun driving in a British Overseas Territory (we drive on the left!). With a rental vehicle, it’s convenient to see the island’s historical sights and the National Museum, sites which represent epochs including the pre-Columbian Tainos, the Age of Discovery, the Victorian-era, the U.S. Space Race, and more. The museum is likewise a perfect place to get tourism information and island gossip! The sparkling ocean at Governor's Beach, Grand Turk. The Turks and Caicos Islands is home to many of the finest beaches in the world and Grand Turk certainly doesn’t break the rule. Incredible and serene white sand beaches line many of the island’s coasts. The amazing Governor’s Beach offers unparalleled crystal water and white sand. On the typical calm and sunny day, the clarity is unbelievable. The sheltered and shallow water here is perfect for the whole family. The beaches fronting the Grand Turk Cruise Center and Cockburn Town are beautiful and pristine as well. Pillory Beach to the north of Cockburn Town is another tranquil spot, with calm water and beautiful snorkelling spots. For those looking for a bit of seclusion when on vacation, the wild and flotsam-strewn East Side Beach and White Sands Beach are excellent for beachcombing. Grand Turk offers consistently-excellent vacation weather. The entire west coast, where all of the main beaches and the cruise centre are located, is typically sheltered from the trade winds and allows for perfect beach holiday conditions. The pool at the Grand Turk Cruise Center. 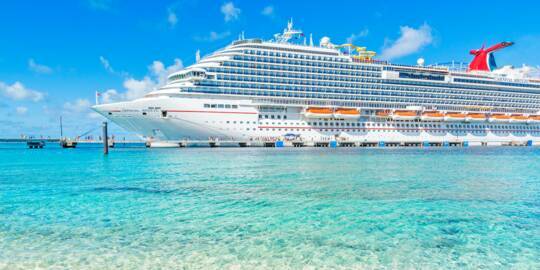 The popular Grand Turk Cruise Center welcomes nearly a million guests every year and serves several ocean liners weekly. 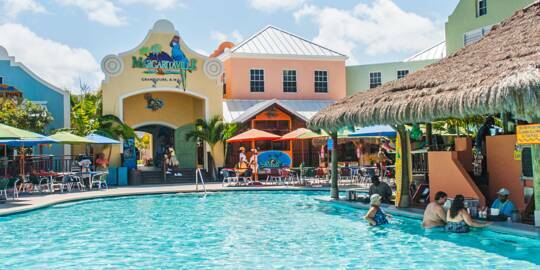 Here you’re find a lagoon-like pool, duty-free shopping, and the largest Margaritaville in the Caribbean. The Cruise Center also serves as the launch point for many activities and shore excursions, including island tours, snorkelling cruises, 4x4 expeditions and more. For those looking to experience the deep blue ocean offshore, a fishing trip or whale watching adventure is a great excursion. Families with children will enjoy the FlowRider artificial surf attraction, space exploration exhibits, and the beautiful Governor's Beach. Diving the wall off Grand Turk. Interested in seeing coral, turtles, fish, whales, and sharks? The diving and snorkelling off Grand Turk is varied and vibrant. The sheer drop off of the coral wall, where the depth falls from 50 feet into the thousands, attract SCUBA divers from all over the globe. Unlike many other destinations, it’s only a two minute boat ride out to the barrier reef and to the island’s best dive sites. Columbus Landfall National Park, said to be the first dry ground reached by Christopher Columbus on his historic voyage of discovery to the New World, protects much of the island’s reefs and beaches. For cruise tourists, bookings can be made both through the cruise line and directly with the dive company. For other visitors, many of the dive companies and accomodations offer packages and deals to make the most of your budget and trip. Cycling on the streets of old Cockburn Town. 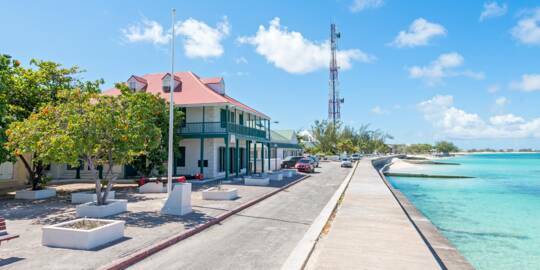 Although the many visitors to Grand Turk only stop over for a few hours from a cruise ship, Grand Turk offers quite a few quaint inns and hotels to choose from for those who wish to stay overnight. Rooms and prices vary from budget hotels to luxury, renovated mansions. Keeping with the laid-back Caribbean atmosphere of the island, there are no large hotels or all-inclusive resorts. Oceanfront vacation rentals, typically refurbished colonial mansions, make up the majority of accommodations. Many lodgings offer a wide range of amenities and services, including the complimentary use of bicycles and water sport equipment such as kayaks and stand up paddle boards. The Bohio Dive Resort, the island’s only all-inclusive option, is perfectly-located on a private stretch of Pillory Beach. This accommodation is great for scuba divers and non-divers alike. There’s great dining and exquisite beach and ocean to enjoy. Beachfront Cockburn Town at sunset. 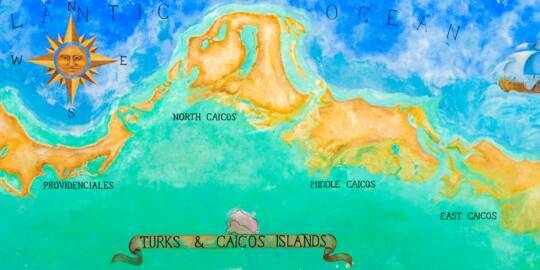 Since 1766, Grand Turk has been the capital of the Turks and Caicos Islands. Originally founded by Bermudian salt collectors in 1681, the island still retains a colonial heritage through its colonial buildings and old salt salinas. Donkeys and horses, once the only means of transportation, now roam freely in the wild. For such a small island, Grand Turk has seen quite a colourful past. Historical sights and attractions can be seen throughout the island, reflecting every epoch from the colonial days to the space race. Today, Grand Turk is the centre of Government in the Turks and Caicos, and tourism provides the primary income. The quaint beachfront Cockburn Town is the capital city of the Turks and Caicos. The beach at Cockburn Town, Grand Turk. As the capital of the Turks and Caicos, the oceanfront settlement of Cockburn Town is home to much of the British-Bermudian architecture in the Turks and Caicos. 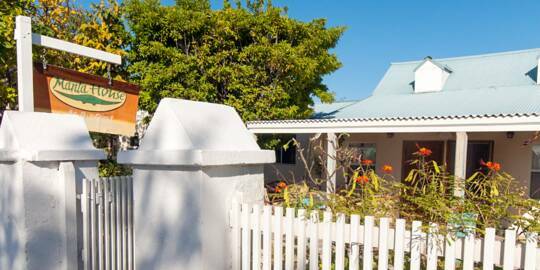 Along the beachfront Front Street, Queen Street and Duke Street, old stuccoed limestone block buildings and rental villas stand, many with interesting histories. There’s the old Victoria Library, the post office, and colonial-era attraction of Her Majesty’s Prison. On the east side of Cockburn Town is the National Museum. This quaint house, one of the oldest still-used buildings in the country, is the best place in the country to get an insight into the history of the Turks and Caicos. Among the treasures here are 1000 year-old Lucayan objects and artefacts from the historic 1513 Molasses Reef wreck, the oldest excavated European ship remains found in the New World. Cockburn Town also features a cultural market that offers handmade gifts and souvenirs from the Turks and Caicos and neighbouring Caribbean countries. 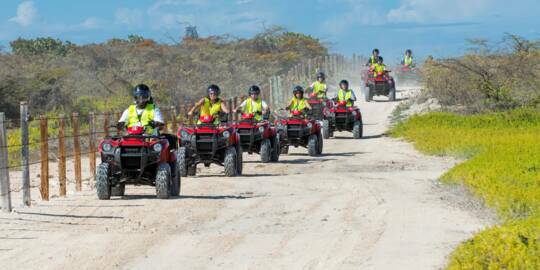 ATVs on the Grand Turk Lighthouse coastal path. The most-recognizable structure in the Turks and Caicos, the Grand Turk Lighthouse overlooks the treacherous North Reef. Built in 1852, this cast iron tower was prefabricated in England. Found on the scenic and high bluffs of North East Point, the grounds of the Lighthouse provide great vistas over the reefs, North Creek, and the adjacent and abandoned US Navy NAVFAC 104 Base. The Grand Turk Lighthouse can be visited on your own, or you can take an organized tour or 4x4 excursion. A sea of salt crystals at Hawkes Nest Salina, Grand Turk. In previous centuries, Grand Turk had a thriving sea salt industry. The mainstay of the Turks and Caicos economy for nearly three hundred years, millions of bushels of prime sea salt was exported to destinations throughout North America. It’s difficult to believe, yet at one time the output from Grand Turk and the nearby Salt Cay accounted for roughly one sixth of all salt used in the English-speaking settlements in North America! The natural and shallow salt ponds found throughout the country were perfect candidates for the task of salt production. Ponds were developed into salinas, with a complex network of low stone dividing walls, gates, channels and windmill pumps. Ocean water would be transferred into the salinas through small stone-lined channels. As the water naturally evaporated under the intense sun, sea salt would remain. During the summer dry season, mountains of salt crystals would be raked and gathered, where it would be bagged and ferried by lighter boats to waiting ships for exporting. Although the sea salt production ended in the 1950s, much of this infrastructure still remains today, waiting to be discovered. The beautiful Gibbs Cay from the water. Found off the east coast of Grand Turk, the pristine Gibbs Cay is another top attraction. At this little island, tame and friendly stingrays of all sizes flock to the boats that visit the area and freely interact with people. With clear water, white sand and rolling hills with sea oats, Gibbs Cay is the perfect small tropical island. It’s possible to snorkel in the shallow clear water with the stingrays – an all-too-rare opportunity of experiencing large marine life close-up in their natural environment. The reefs surrounding Gibbs Cay are also fun to discover. You’ll see queen conch in their natural sea grass habitat, colourful fish, coral formations and the occasional turtle. The Salt House on Grand Turk offers a wide range of authentic Turks and Caicos gifts. There’s a wide selection of restaurants to choose from on Grand Turk. In addition to the dining options at the Cruise Center, excellent and tranquil spots for lunch and dinner can be found across historical Cockburn Town. If you’re looking for an authentic Turks and Caicos dish, there are many eateries that feature a menu inspired by local cuisine. Try conch salad, fish with a side of peas n’ rice, or pan-poached grouper. If an oceanfront restaurant sounds like the ideal setting, there are several choices in Cockburn Town and near the Grand Turk Cruise Center. Some great Grand Turk restaurants can be found in the quaint accommodations in historical Cockburn Town, and these establishments are the primary dinner choices, as many of the eateries that cater to the cruise ship arrivals close by late afternoon. Shopping is varied as well. The cruise center offers by far the greatest selection of souvenir and gift shops. However, several boutique stores are found in town as well, including the Salt House, an excellent tourist shop that’s complete with free exhibits on the sea salt industry. The country’s own interCaribbean Airways at Providenciales International Airport. Grand Turk is an interesting destination, and a luxury cruise isn’t the only way to travel to the island. No regular international flights land at Grand Turk, however many scheduled local flights are offered daily from Providenciales. Grand Turk is only 20 minutes by air from Providenciales, and the flight over is quite scenic, with small islands and the incredibly-turquoise Caicos Banks below. For those staying on Providenciales, it’s easy to book a flight and fly over on a day trip to see the attractions and activities of Grand Turk. Simply book your flight and transportation, decide which sights you'd like to explore, and consult the map. 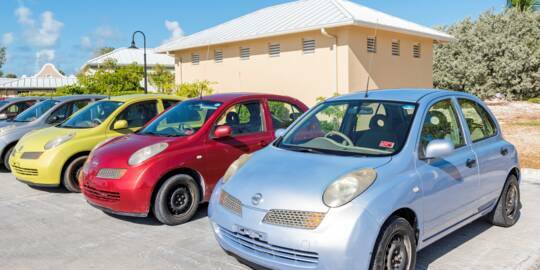 Your rental car or a taxi can be picked up from outside the Grand Turk JAGS McCartney International Airport (GDT). Grand Turk’s boutique hotel and villa options are wide for those interested in staying overnight. And for those interested in living on Grand Turk, our extensive real estate section has you covered. Cruise ship and beach at Grand Turk.